Professional lawn maintenance can transform your lawn’s overall appearance. If you’re considering hiring lawn care maintenance in Flowery Branch, then consider these benefits that you’ll get to enjoy. If you don’t have to make time in your schedule to manage and maintain your lawn, then that gives you more time to invest in other areas. The time and effort it takes to manage your lawn can remove other opportunities from your evenings and weekends, such as time playing with your kids or doing other outdoor activities as a family. 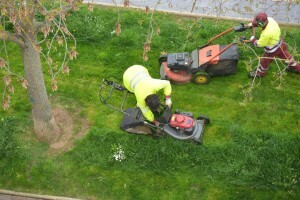 A professional maintaining your lawn on your behalf frees up your time to do other things. Not all lawns are the same, even if they all look the same to the untrained eye. Hiring a lawn care expert means you can rely on their expertise for understanding any deficiencies or issues going on with your lawn. They can help you identify the causes to specific issues with your landscaping and they can provide educated strategies for how to approach solving them. Their experience and knowledge can help you make the most of your lawn. Look for special certifications and whether they belong to a broader landscaping organization. This will help reassure you that they’re educated and qualified to help you. Perhaps you’re new in town and you’re trying to sort out what to do with the strange tree in your front lawn. An expert lawn maintenance provider should have a knowledge and understanding particularly of the variances in local greenery. Trees, shrubs, and the earth itself vary from state to state, and a true lawn care maintenance professional is going to understand the nuances of the regional flora where they live. Keep these benefits in mind as you continue your search for the right lawn care maintenance in Flowery Branch and the surrounding areas.